New Jersey native, Chef Harold Moore, honed his craft working in local restaurants before graduating from the prestigious culinary school, The Culinary Institute of America, located in Hyde Park, New York, and working at some of New York’s legendary restaurants, Daniel, Jean Georges, March, Mercer Kitchen, and Montrachet. Over the years, he has achieved many culinary kudos including earning his first Michelin star while at March, and a James Beard Foundation’s nomination for Rising Star Chef of Year. 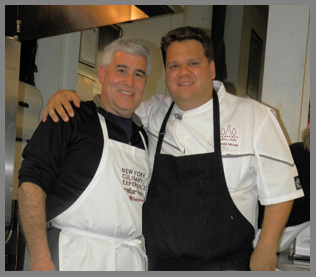 Since 2008, Chef Harold Moore has commanded the “grand piano” (chef talk for the large stove in restaurant kitchens) at Commerce restaurant located in Greenwich Village, in New York, which he owns with business partner, Tony Zazula. I had the opportunity to learn from, cook alongside, and get to know Chef Harold Moore by taking his class during The New York Culinary Experience 2013 hosted by New York magazine and The International Culinary Center. Passionate, dedicated, and fun, Chef Harold Moore created an atmosphere of excitement while introducing technique and style for a very memorable day of cooking. 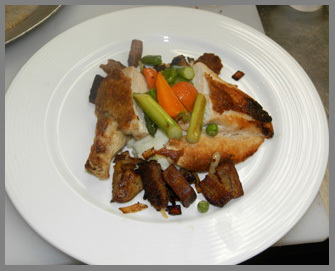 Chef Harold Moore graciously shares his recipes from the class for Roast Chicken with Foie Gras Stuffing, Potato Puree, and Market Vegetables; and soft and fluffy dinner rolls. Bon Appetit! Method for the Chicken and Foie Gras Stuffing: Preheat oven to 400° Fahrenheit. In a large ovenproof roasting or sauté pan or roasting pan, heat the oil over high heat. Season the chicken breasts with salt, pepper, and place them skin side down in the hot oil. Sear for two minutes or until the skin is golden brown. Turn the breasts over and place in the oven for 15 minutes or until a thermometer inserted into the thickest part reads 165° Fahrenheit. When the chicken is cooked, transfer it to a plate to rest. Method for Foie Gras Stuffing: Add the bread cubes to the roasting pan and toss to coat in the oil. Return to the oven and toast for 5 minutes, stirring halfway through. Place the toasted croutons in a medium bowl and set aside. Heat 2 tablespoons olive oil over medium high heat Sear the foie gras on two sides until brown, about 2 minutes. Add onion to the pan, stirring occasionally, until they are soft and golden brown, about 5 minutes. Sprinkle the flour over the onions, stirring to coat. Add chicken stock and boil for 5 minutes or until the sauce become thick, stirring occasionally with a whisk. Pour ¼ cups of gravy over the toasted bread and toss to coat. Method for the Potatoes: Place the potatoes and 1-tablespoon salt into a large pot and cover with cold water. Bring to a boil and simmer until the potatoes are tender. Saute chopped chives. Drain and return the potatoes to the pan. Add the cream, sauted chives, butter, and 1.5 teastpons of salt and pepper to taste, and mash. Hold covered until the chicken is ready. Method: Stir the yeast into the warm water and let sit for 5 minutes. Mix all ingredients except the egg in the bowl of a stand mixer for 3 minutes on low. Increase the speed to medium for another 3 minutes. 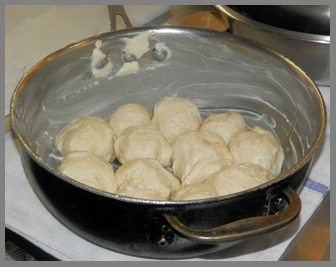 Place in an oiled bowl, cover with a damp cloth or plastic, set in a warm place, and let rise for 1 to 1 ½ hours or until doubled in size. Place on a clean, dry wooden cutting board or table and divide into 12 equal pieces. Roll each piece into a ball using your cupped hand. Place, evenly spaced, in a lightly buttered 12-inch cast iron pan. 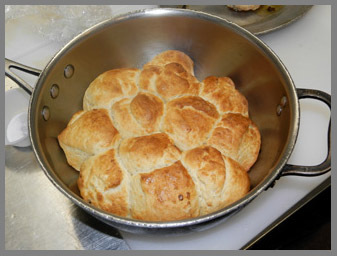 Cover again with a damp towel and let rise for 30 minutes or until the rolls are touching. Brush lightly with egg, place in a 350° Fahrenheit oven and bake for 18-20 minutes or until browned. 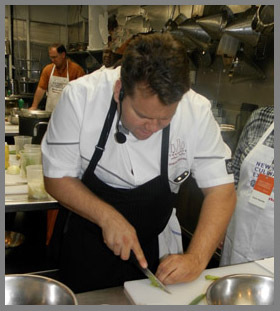 Read about the class with Chef Harold Moore and other classes during The New York Culinary Experience in the Gastronomy section and interviews and recipes from the other classes in the Chefs' Recipes section. © September 2013. Luxury Experience. www.LuxuryExperience.com. All rights reserved.